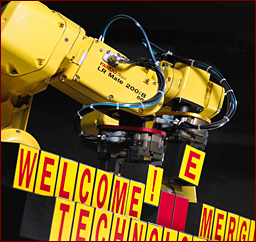 Midwest Robotics Ltd: Engineering and System Integrator of Robots - PLC - Controls - Welcome !! Midwest Robotics is a high-tech robotics, automation and glass equipment company based in Columbus, Ohio, USA. Development and successful implementation of special processes, e.g. Robotic loading of Glass Furnaces, Washing machines, Robotic Finishing of Parts, Force control, etc. choose to work with us. Accudeflash (USPT# 6,086,294) is a trademark of and distributed under license from FANUC Robotics America, Inc.